Loosely included under the rubric of terracotta "figurines" are the terracotta masks found at some Harappan sites. 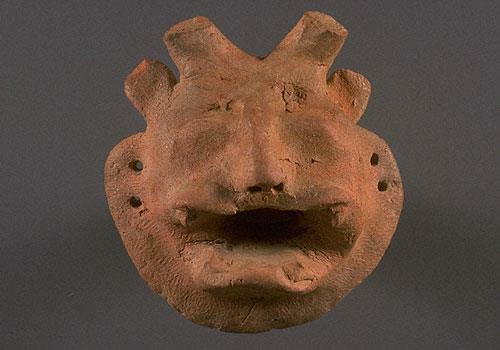 This mask clearly has a feline face with an open mouth with exposed fangs, a beard, small round ears and upright bovine horns. It is small and has two holes on each side of the face that would have allowed it to be attached to a puppet or worn, possibly as an amulet or as a symbolic mask. The combination of different animal features creates the effect of a fierce composite animal. As an amulet or a symbolic mask, it may represent the practice of magic or ritual transformation in Indus society. See also Anthropomorphized Tiger in Harappa.